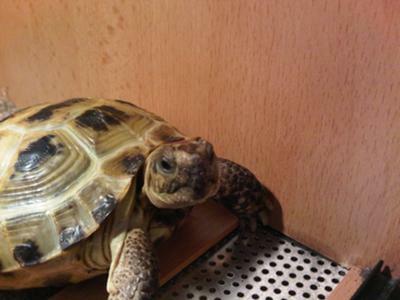 This is Marcel, he is a horsefield tortoise. Unfortunately we don't know how old he is. He joined our family just over two years ago when we spotted him in a pet shop and fell in love with him. Marcel loves to wander around the house and garden but we have to keep a close eye on him as he can get in to the smallest hidey holes. We once lost track of him and after and hour of searching and worrying we found him. He had climbed on top of a pile of ironing I had just done and was basking in the sun. Marcel also loves to take a nap in his dads slipper (photo below) and stretching out on my warm belly. We would love to one day adopt lots of brothers and sister for Marcel. 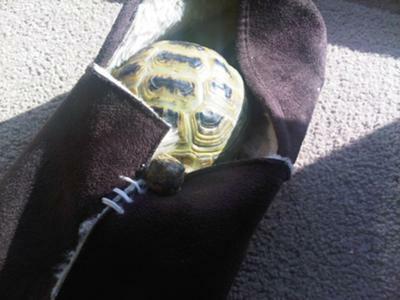 I like the picture of Marcel napping in the slipper. He seems very comfortable. Be sure not to put your foot into the slipper while he is in there. Thanks for sharing your photo and stories.